August is here. Children and their teachers will soon be back in school and we can finally look forward to the changing of the seasons. It has been an eventful year so far. 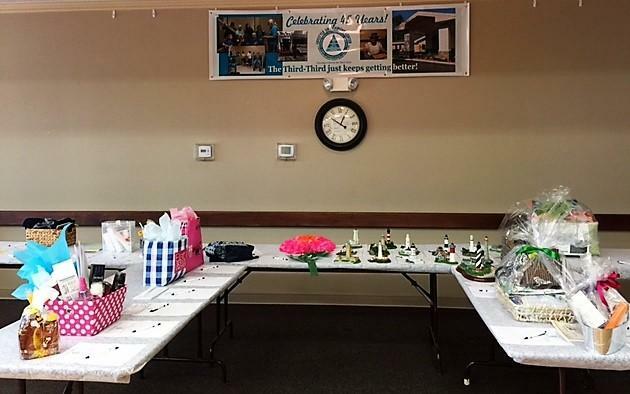 In April, we celebrated ten years in the LifeStyle Enrichment Centers in Lake City and Ft. White. The holistic programming concept of the LEC’s has proven attractive in our communities. We have actually outgrown the Lake City site. Physical fitness activities have been so popular that Staff is beginning to look at how we could make the second phase of the building a reality. It appears that many people in the community would love to see an indoor pool which would operate in all seasons. The therapy aspect of such a pool would be a boon for people recovering from orthopedic surgery and those suffering from the pain of arthritis and other joint and muscle ailments. presented a variety of new products they are thinking about offering in their stores. We had a wonderful time sampling all of the goodies and telling them what we liked best. We also had a relaxing afternoon talking to old friends and listening to the beautiful music provided by Lonnie and Dana Philips. In September, we will celebrate four years of operation of The Club. Joann Flegert, RN and Christina Church, CNA have provided hours of enjoyment, love and care to many people suffering from dementia. Caregivers have found a safe place for their loved ones while they can take a break from 24/7 caregiving. Until you have been either the patient or the caregiver you cannot understand the blessings provided by the Staff of The Club. 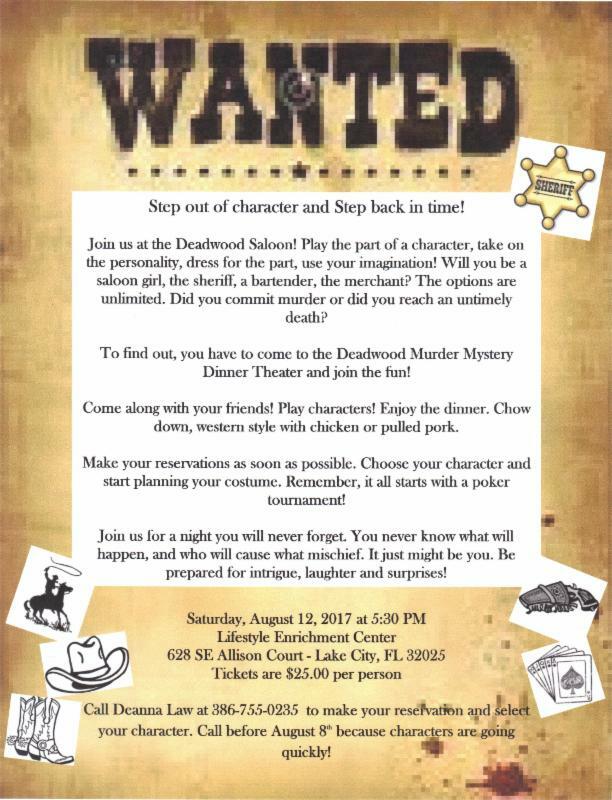 I look forward to seeing you on August 12th as we turn the Lake City LEC into the Deadwood Saloon for our first ever Murder Mystery Dinner Theater. Come and become the character you always wanted to be in the old Westerns. What a great time was had by all at our 45th Anniversary Celebration. 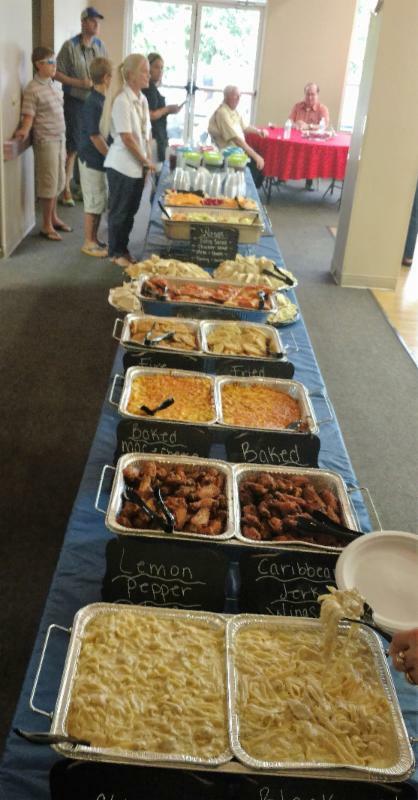 S&S Foods did a wonderful job of preparing an assortment of foods that were enjoyed by all. We want to thank the many businesses who donated to our silent auction. 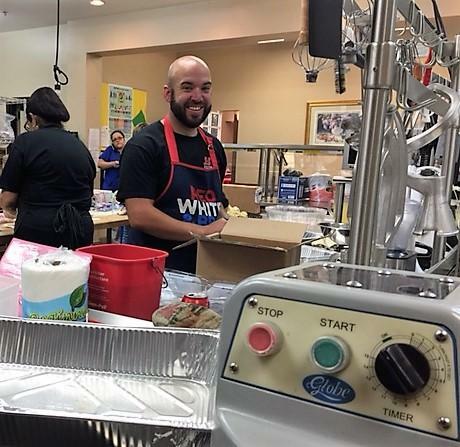 It was a huge success and their contributions were greatly appreciated. 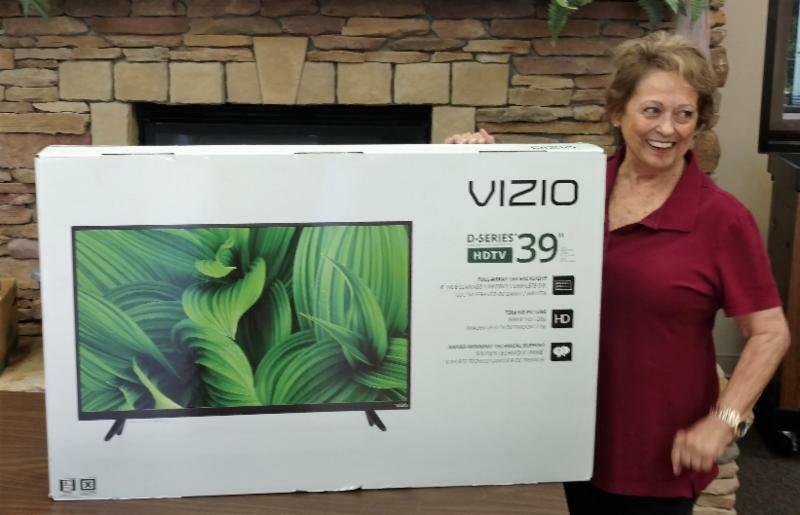 Diane Holbrook was the winner of the 39″ Vizio television which was donated by S&S Foods. Relaxing with friends at the 45th! 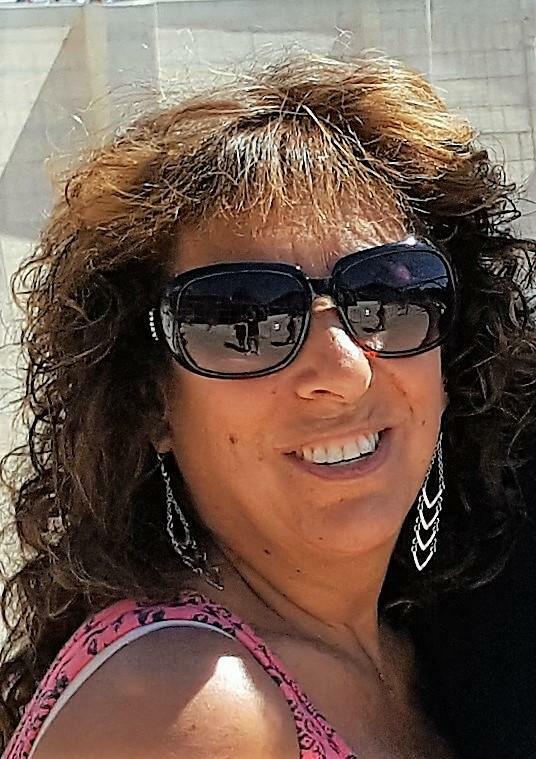 Our board member Lorraine Zarrella describes herself as a “quiet” person who enjoys outdoor activities and spending time with her family which includes two daughters and two sons; and five grandchildren. As the Human Resources Benefit Specialist at New Millennium Building Systems, where she has been employed for the past 11 years. 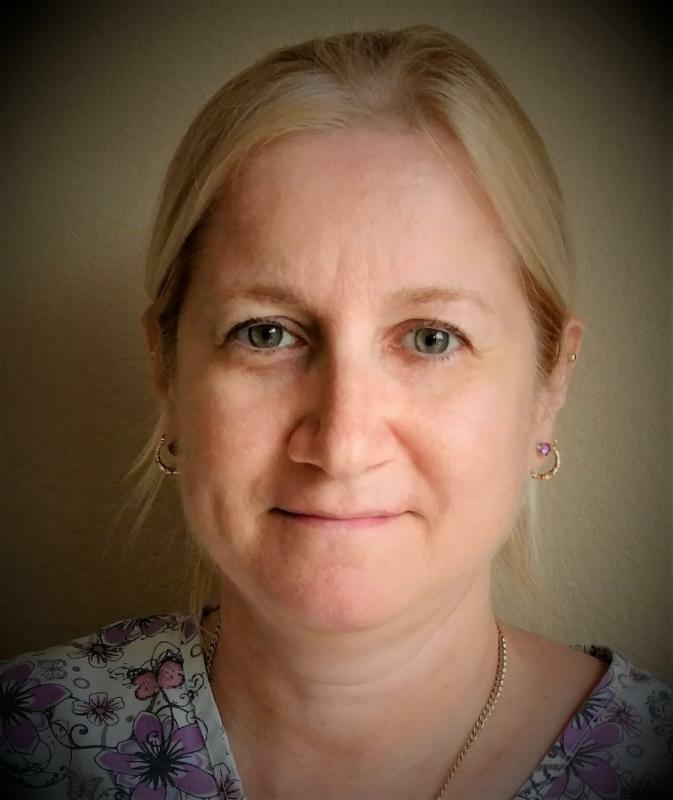 She has enjoyed helping her fellow workers by serving on the company committees to plan their special events, such as their Annual Family Days, Christmas banquets and employee dinners. Retirement is 44 months away and she says she is not counting the months. Lorraine tells us, “She and her husband, John, are looking forward to traveling and seeing the country”. 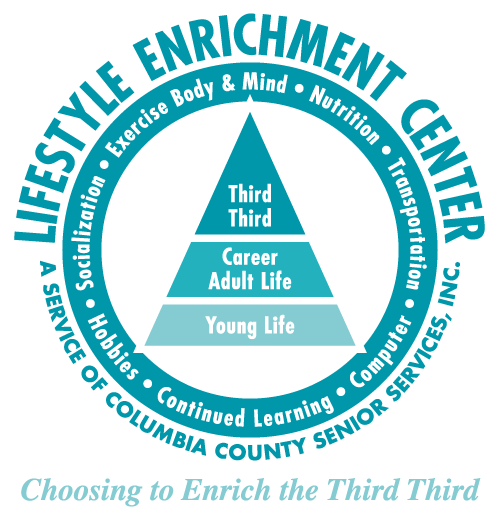 Lorraine’s parents utilize the Lifestyle Enrichment Center. 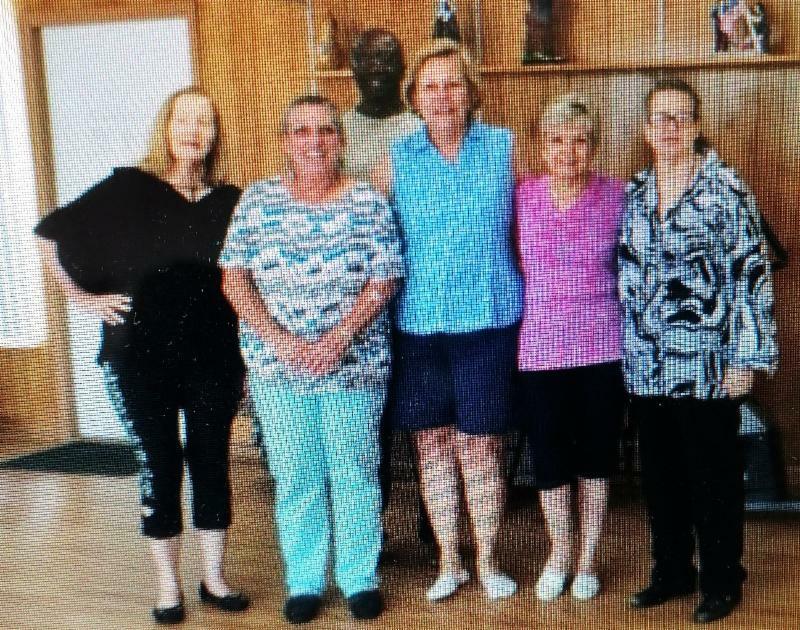 According to Lorraine, “Seeing them enjoy and benefit from the activities available, made me aware of this wonderful organization and the services they offer to the 60+ community. Being on the Board has made it possible for me to become more involved and to actively give back to our community”. 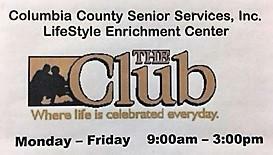 The Club is our Dementia Specific Adult Day Care facility. The Club participants were studying woodwind instruments and were excited to be entertained by a member of the student band from Lake City Middle School. Two of the present participants were former marching band members and enjoyed listening to the flute recital. For more information, call JoAnn Flegert, RN at 386-438-8621. 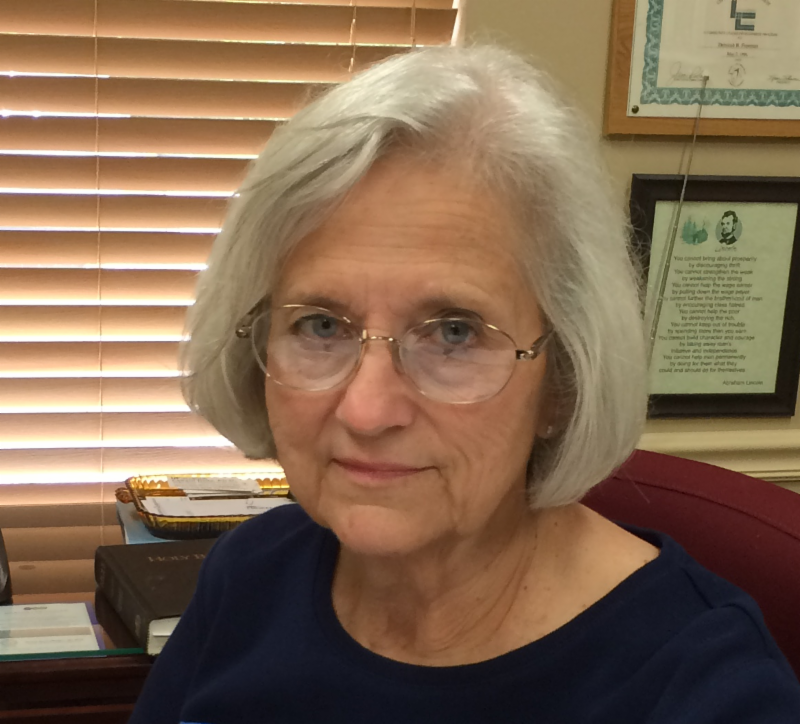 Gail Griffis came to work for Columbia County Senior Services in July of 2010. Before becoming a C.N.A. she was working as an Assistant Manager of the Beverage Barn here in Lake City. With her C.N.A. 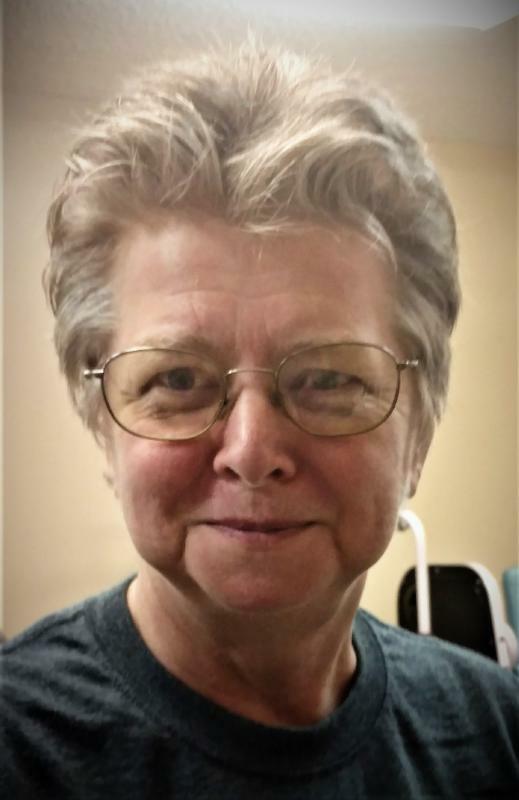 Gail is able to help others keep their independence so they are able to continue living at home. Visiting clients in their own home where they are comfortable, allows the regular caregivers a break. Gail enjoys her time with the clients and is happy to be able to provide the respite care needed during these visits. All of Gail’s clients appreciate her visits and care; and the consideration she shows them. They are quick to say thank you for Gail’s great job! Janet tells me she is a vagabond at heart; born in Kentucky, and until 2001 when she moved to Florida had never lived anywhere for a full year. Her working career started as a Kelly Girl in Cincinnati. Shortly thereafter, she became a freelance entrepreneur concentrating on time management and corporate reorganization. Later Janet gravitated into construction management; constructing government projects such as schools, military installations and prisons. After a major car accident in 1991 she found herself working in the computer industry, teaching people of all levels how to use computers and software and, working on computers. She endured about 15 years of extensive therapy and rehabilitation. Now, is maintaining, with the help of the fitness center at the LEC. As a Wordsmith, she established a publishing company and wrote and published five books for herself, as well as books for others. As a journalist, she has written and published more articles on more subjects than she could ever remember. Reading and traveling are her obsessions. Travel is her main interest. Janet takes three to five trips per year. So far she has visited, lived-in or worked in every state in the US, been to all the continents, around the world three times; and visited 148 countries. Her first volunteer job, as a teenager, was as a cub scout troop leader. As a teenager, Janet started her first company, through the Junior Achievement Organization. According to Janet, “It seems I have always been a volunteer, somewhere, doing whatever needed to be done”. Life is pretty grand and Janet is enjoying it. Someplace along the way she learned two words, “Yes” and “Know” and we caught on to that pretty quick. We appreciate her sharing her skills and time with us. 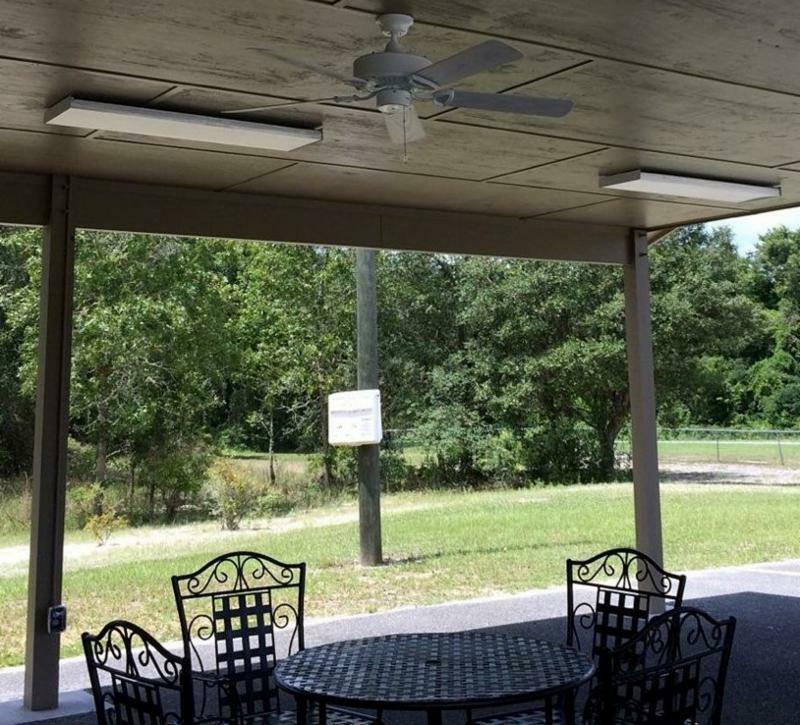 Ft. White completed the construction on their new pavilion. Stop by and see it. Now all they need is someone to donate a grill so they can enjoy some hamburgers and hotdogs! You have been named as an “Agent” (also known as an “Attorney in Fact”) in a Florida Durable Power of Attorney. The person who signs the Power is known as the “Principal.” The document gives you the authority to act for the Principal in the situations listed in the Power. Though each Power of Attorney is unique, here are some general concepts which always apply. The funds and property you are authorized to handle remain the property of the Principal, and all actions taken should be on the Principal’s behalf or for the Principal’s benefit. As long as the Principal is not incapacitated, the Durable Power of Attorney does not take away the Principal’s authority to handle his/her own affairs; it simply authorizes you to do so, as well. 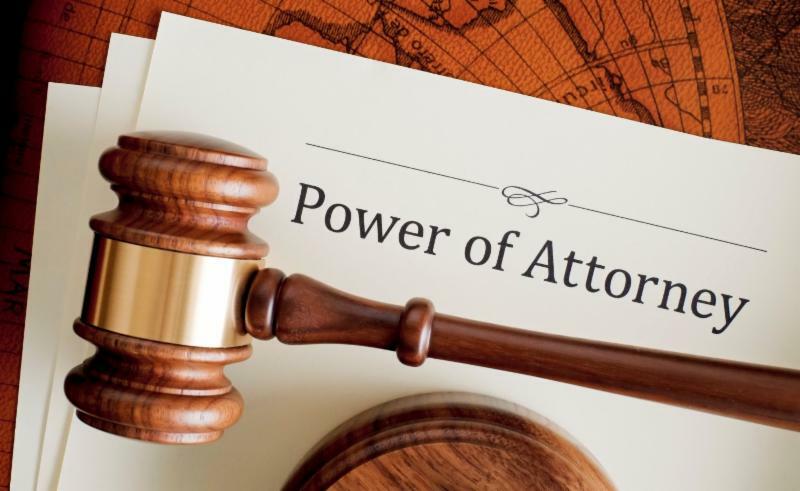 The Durable power of Attorney is effective immediately even if the Principal is legally competent. The Durable Power of Attorney allows you to continue to act even if the Principal becomes incapacitated. If you sign for the Principal, be sure to indicate in writing that you are doing so as the Agent. An Agent cannot decide where the principal lives or with whom the Principal associates. An Agent does not make health care decisions for the Principal; the person named as the Principal’s Health Care Surrogate handles those decisions. An Agent cannot vote for the principal. An Agent cannot change any Will or provision designed to take effect after the death of the Principal (e.g., cannot change a beneficiary on a life insurance policy). Any Agent may not act after the Principal’s death; an Agent is not the same thing as a Personal Representative or an Executor. And finally…Social Security does NOT accept Durable Powers of Attorney. These are very basic points common to all Agents with a Florida Durable Power of Attorney. If you have any questions about an action you plan to take that isn’t mentioned here, or about your personal liability, please review Florida Statutes Chapter 709, Part II, or contact an attorney for further specific advice. Please call us if you would like to be a 2017 sponsor for this Newsletter or other special items at 386-755-0235 extension 108. Your name will appear with your company logo and information in a prominent space. We celebrated our 45th Anniversary on the 15th. 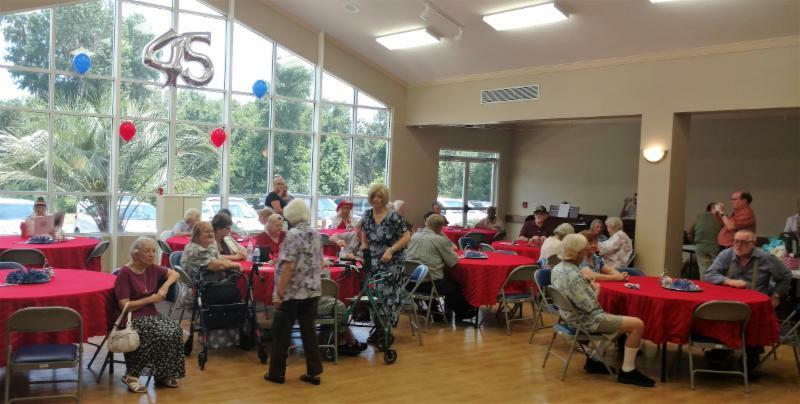 The Kenny Burt, LeRoy Newton and Martengale Duo bands performed for the seniors this month. The arts & crafts and the sewing groups continued with their projects. The wood crafters met, and the card players and bridge players could be heard throughout the building shuffling cards. The Reading Room and The Resource Rooms were reorganized. The seniors continue to enjoy the Friday Night Dances every week. Friday Dances at 7:00 PM with Potluck dinners.